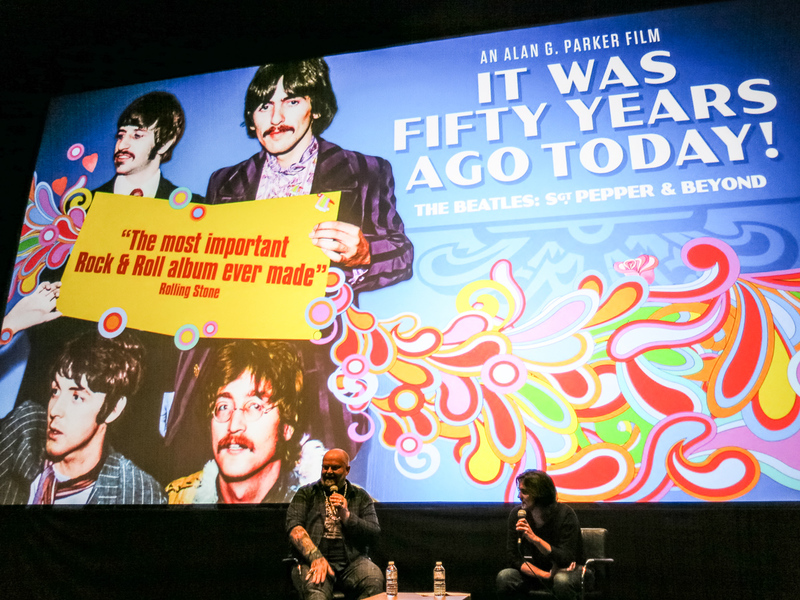 On the anniversary of the release of Sgt Peppers, Getintothis’ Keith Ainsworth gets into a newspaper taxi to see a brand new film all about the landmark album. The UK has a new number one. The Beatles Sgt. Pepper’s Lonely Hearts Club Band in its new anniversary stereo mix is back at the top. To celebrate I ordered a newspaper taxi to take me away to FACT. The cinema was showing the new film It Was 50 Years Ago Today! The Beatles: Sgt. Pepper and Beyond. Alan G. Parker‘s film spans either side of the Pepper era from the end of touring to the Maharishi and the sad demise of manager Brian Epstein. It recounts the tale that Lennon, fed up with not being heard in concert, would substitute singing ‘Twist and Shout’ for ‘I’m pissed with gout’. Even before Pepper their songs had advanced in complexity. They did not perform any tracks from current album Revolver on their last 1966 tour. With touring put aside they had time to reflect and created atmospheres that were mixtures of their English childhoods and Lewis Carroll whimsy. The initial idea for the new album was to be inspired by their childhoods. The first recordings were Strawberry Fields Forever and Penny Lane. These were taken for a double A side single and left off the album. They had summed up the childhood concept so perfectly there was no need for more. The focus of the era became less about hit singles and more about whole albums as a complete experience. Removed from the pressures of touring the band decamped to Abbey Road studios and brimmed with enthusiasm and ideas. Paul McCartney particularly had immersed himself in the London avant-garde absorbing ideas about art and music outside of conventional pop. Enabled by producer George Martin and envelope-pushing engineer Geoff Emerick they spent months experimenting with sound. Secretary Barbara O’Donnell at Beatles company NEMS tells the story of George Harrison bringing her handwritten lyrics for the Pepper songs to type up clearly. She winces as she tells how she just threw these originals in the waste paper basket afterwards. The album needed a memorable cover. The film shows a remarkable photograph from the 1930s of Pauls dad, Jim. It shows a group of around 50 people standing in rows gathered around a large bass drum with ‘Jim Macs band’ written on it. That seems strangely familiar! Biographer Hunter Davies tells of grabbing interesting items on his way to photographer Michael Copper‘s studio. From Paul’s mantelpiece he pulled an ornament that ended up in the foreground of the final image. Beatles original drummer Pete Best tells how he lent his grandfather’s treasured medals for the band to wear on their bright satin military uniforms. The film introduces Guru Maharishi Mahesh Yogi, the developer of Transcendental Meditation. Surprisingly we were told this spiritual guru had a degree in physics. As their attentions were turned in his direction their manager Brian Epstein died from an overdose of sleeping pills. The film contains unique footage from HTV Wales taken in Bangor immediately after Epstein’s death then an unseen news report outside his house in London. Simon Napier Bell recounts in fascinating detail his times with Epstein in his final days. Without Epstein to be their protective shield from hangers on and to mediate in band disagreements the band’s future became less certain. A friend of Lennon named ‘Magic Alex’ epitomises this. He would obtain the Beatles financial backing for projects like a roll of wallpaper with microphones in it. This would give the best sound ever! The film doesn’t use any Beatles music but the quality of the interviewees such as Bill Harry, Hunter Davies, Tony Bramwell, Pete Best and Julia Baird bring those times to life effortlessly. Even following last year’s Ron Howard movie the team have managed to dig up footage that has never been seen before. I spoke to the director before the showing of the film and he told me that in several cases they were told, ‘this footage has not been licensed for 49 years.’ The digging has turned up colour footage John and Paul in India plus colour footage of the Apple Boutique shop. Beatles fan and Buzzcocks guitarist Steve Diggle suggests the music has the feelgood factor that has healing properties. Jenny Boyd recounts how the album reflected the lives of herself and friends. No longer black and white but full of colour. Even for The Beatles the album was an event which seemed to be played everywhere when released. Pepper was a masterpiece, a pop symphony with something for every mood.